You are here: Home / Holiday / Halloween / One Genius & Inexpensive Treat To Hand Out for Halloween That Isn’t Candy! 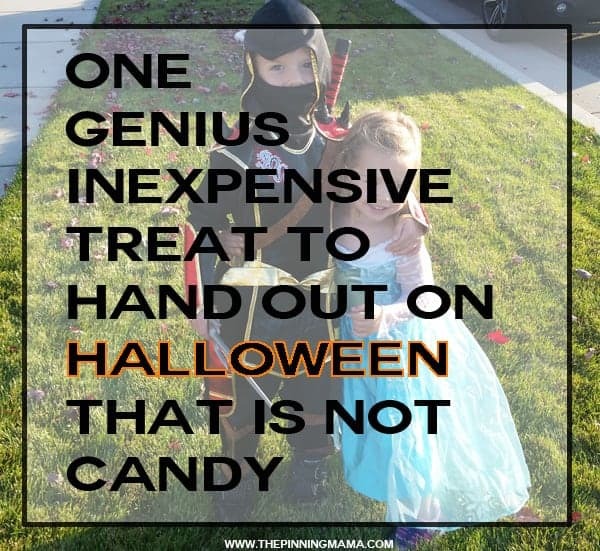 One Genius & Inexpensive Treat To Hand Out for Halloween That Isn’t Candy! One really great and affordable idea for something to hand out for Halloween that isn’t candy and trick or treating kids will LOVE! Each year, even at such a young age, my kids can remember the houses that gave out something cool for Halloween. It could be a fun experience or a unique treat. They can point to the doors that give full candy bars and the one that gives little mandarin oranges with jack o lantern faces drawn on. Handing out something other than candy can really make you somewhat of a legend in the eyes of the neighborhood kids! 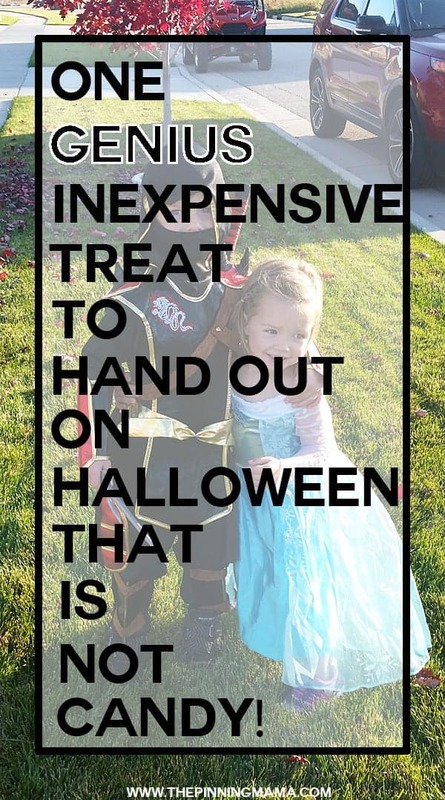 This year I found a really special idea I wanted to share with you on both something unique, affordable and perfect to hand out as a treat alternative to candy, and also something that you can feel really great about supporting. 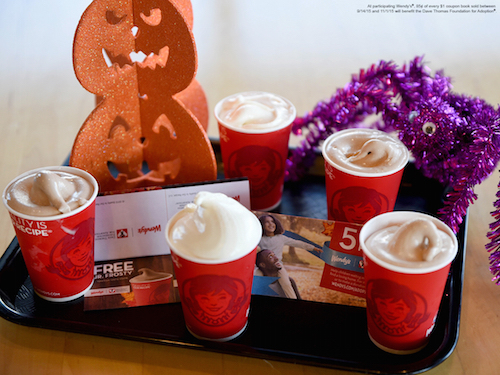 From now though November 1, Wendy’s is selling Halloween Coupon Books. 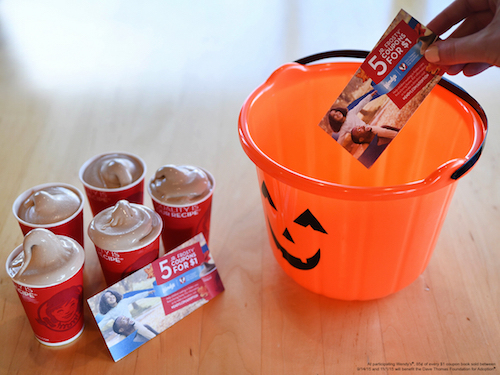 For $1, customers can get 5 or 10 free Jr. Frosty coupons*. These coupons make a fun treat that they can enjoy once the candy coma wears off and spend some quality time with mom or dad. My kids would be beyond excited to find something so unexpected but such a fun treat as they sort through their loot. 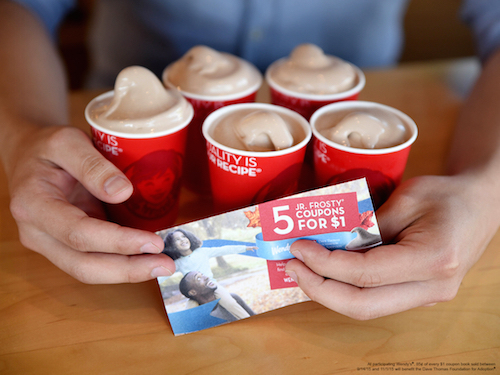 Wouldn’t it be so great to be the Frosty house? While I watch my children have so much joy on this holiday, I can’t help but think of the over 130,000 children in the foster care system in North America. Over the past couple of years I have had the gift to personally witness the joy in making a forever home to a child by adoption with a few of my close friends. As a mother, that effortless choice to love that child as their own as they welcome them into their family is something that will always stay deep within my heart. Wendy’s Founder, Dave Thomas, was adopted as a child and knows first hand how important the role of family is. He established the Dave Thomas Foundation for Adoption in 1992 which works tirelessly to find forever homes for the children waiting in the foster care system. Wendy’s has passionately supported the foundation and the cause ever since. Each year they drive fundraising efforts to support the foundation and collaborations, and part of that is the Halloween coupon books. Funds from the sales of the coupons books will go to the Dave Thomas Foundation for Adoption® to support programs such as Wendy’s Wonderful Kids. ** It is pretty awesome to see someone use their past to do something bigger, and as a customer get to be such a large part of raising funds so that they can do more. You can read more details on Wendy’s adoption page. Purchasing these books is a HUGE win-win. Not only do you get to be the cool house that is handing out Frosty’s, but more importantly, you are taking an active role in something bigger. Wendy’s and the Dave Thomas Foundation have started something amazing, but they do rely heavily on the generous support of their customers to help them achieve their mission. And they make it so easy by offering coupons at such a discounted rate. We have a neighborhood FILLED to the brim with kids, but buying these really equates to about the same as buying a large bag of candy, and I know which my kids would rather have! Super fun. Super affordable. and Super meaningful. I have never felt better about about buying treats for Halloween or talking with my kids about our opportunity to make a difference in small ways each and every day.